'Today's youth is charting new territories not being afraid of the storm, choosing rather to ride into it and creating their own path,' says Raghu Ram, in our continuing series where Indians tell Rediff.com what they love most about India. What can you say about India that hasn't been said already? I've had the opportunity to travel the length and breadth of this country and there are few things that fascinate me as much. You simply can't help but be in awe of its sheer diversity -- be it in its topography but also in its culture. Culture, this word gains a completely new meaning in the Indian context. Is it possible to put a finger on one thing and say that THIS is Indian culture and THAT isn't? I should doubt it. There are some of us who believe that there are way too many differences in India for it to progress -- be it in caste, creed or religion -- but the fact is that we have not just survived, but also thrived... and we';ve done so BECAUSE of this diversity rather than despite it. I cannot remember where I read this but a French writer has said that if there were as many diverse people in Europe, they would have killed each other. And here we are -- not just living side by side but taking everyone with us on the path to progress. We are the world's largest democracy and one of the world's youngest and are in the midst of a culture shift like we've never seen before. It seems as if today we are living in two Indias -- one that belongs to the older generation and in some ways is seen as regressive; and the other that belongs to the young and is its exact opposite. Needless to say, the second India is what I have a lot of faith in. It is a force that is gaining momentum and it won't be too long before it becomes unstoppable (if it hasn't already). In my line of work, I come across several young people and this is what I have learnt -- that like every generation before their own, these young women and men are looking for nothing more than recognition. They are in that age where they would like to be known, be seen and be heard; they'd like to be at the centre of attention and be the stars of their lives. Now, none of this is unusual for people of that age. Our parents, when they were the age, wanted the same thing. What sets this generation apart is that unlike the previous generation they have a far, far larger platform. They have Facebook and Twitter and blogs and television shows that help them get that recognition and fame. Why hold it against them simply because they have the avenues that the previous generation did not? I find this terribly unfair. Contrary to popular perception, the youth of India know exactly what they want out of life. Everyone I've come across has that burning desire to prove something to themselves and their family. They want to better their circumstances and they want to rise up the social ladder. I find this generation having a lot more direction than the previous one because unlike them, the young today do not lack clarity. They do not want to blindly emulate something just because their parents say so. This generation doesn't believe in playing safe. They dare to think different and they operate with a can-do attitude and confidence that their parents's generation lacked. What sets them apart and what makes me hopeful of India's future is that its youth hasn't inherited the fear and insecurity of its previous generation. They are charting new territories not being afraid of the storm, choosing rather to ride into it and creating their own path. The other thing that defines this generation is their voice. Unlike the previous one, this generation is more vocal, not just on Facebook or Twitter but also in person, which should explain why there have been more protests in these last few years than before. The chalta hai attitude of the previous generation is now fading out and the youth are now beginning to find their voice. I have a lot of faith and belief in them and I am certain that these young women and men will steer this country into the future very effectively. Raghu Ram hosts Roadies, a popular youth reality show set to launch its tenth season on MTV. He is also a television producer, host and an actor. He spoke to Abhishek Mande. 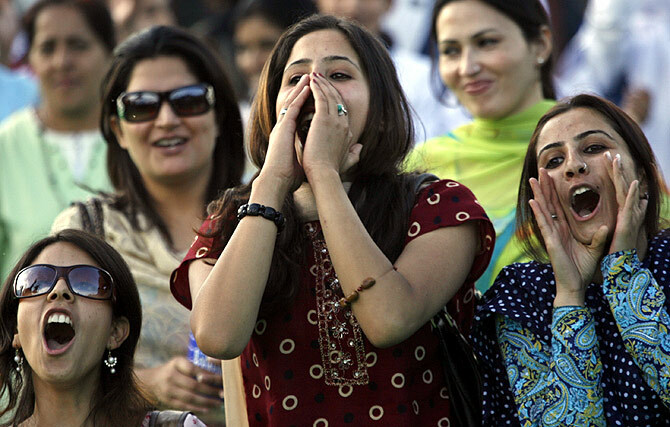 Image: Women at a music concert in Srinagar. Photograph used for representational purposes only.